Hands up if you want to build a human pyramid..
What’s the best-loved party song in Bavaria? Surprisingly, not the latest chart stormer. It's not a yodeller or an alpine horn blower either. It's actually a 1971 hit by Neil Diamond. Everyone – young and old – knows the refrain Wo-ho-ho, good times never seemed so good. And they know exactly what to do when it comes to Hands, touchin’ hands, reachin’ out, touchin’ you. That’s the signal to stretch out hands, flutter fingers in mid-air and form a human pyramid. Like members of some strange sect, willing the holy ghost to move amongst them. I’m witnessing this weird ritual right now. It feels like a happy-clappy church event or ̶̶ the mere thought scares me ̶̶ a Neil Diamond fan club reunion. But actually, what’s happening here has nothing to do with that at all. It’s “Sommerfest” at my daughter’s kindergarten. Huddled up on beer benches in an enormous tent, we’re being jollied by a pop duo with the unpronounceable name of Leidlfestodreiba. “Where are you all, children?” asks the lead singer. Rows of hands rise ̶̶ mostly grownups. Next moment everyone's clinking beer mugs together and breaking into the chorus of “Hey, hey-ey baby, if you’ll be my girl". But it’s not only middle-agers who seem suckers for schmaltz. Local teenagers also crave songs their parents grew up with. It’s difficult to imagine Neil Diamond having the same effect on British adolescents. What is it about these tunes that makes so many Germans, regardless of age, slap their thighs and swing from side to side, as if under hypnosis? I ask Matthias if he likes this music. “Actually not” he says, “I’m more into rock”. Nonetheless, Matthias is dressed in lederhosen, and his wife and five-year old daughter are clad in very pretty dirndls. As if to excuse his folksy outfit, he adds “But this here is different. Local tradition. We have “Stimmung”, good feeling, you know". Matthias describes “Stimmung” by sketching a rough graph. “Look”, he says, joining two axis with a 45-degree line, “The level of willingness to sing and dance rises parallel to the level of alcohol consumed. Oldies and German hits, known as “schlager” unite people of all different ages and music tastes", he explains. “You can have a group of different nationalities, all with different tongues. And music is their universal language”. As if illustrating the global appeal of soppy songs when under the influence of alcohol, he cups his beer mug and starts swinging to the sound of “Country roads take me home”. This John Denver oldie ̶̶ not even the BBC play it any more ̶̶ is another typical crowd pleaser at beer festivals all over Bavaria. Hardly a day goes by without it being played on Bayern Eins, the state's most popular station, with a playlist so changeless you can predict what’s up next. There’s nothing very eclectic about the music playing here in the kindergarten tent, and yet we all seem to be tapping our toes to it. Some parents have even started swaying, doing little jigs, as they hover between bar, beer bench and child’s play area. To find out more about this phenomenon, I meet up with local singer songwriter Maria Reiser. 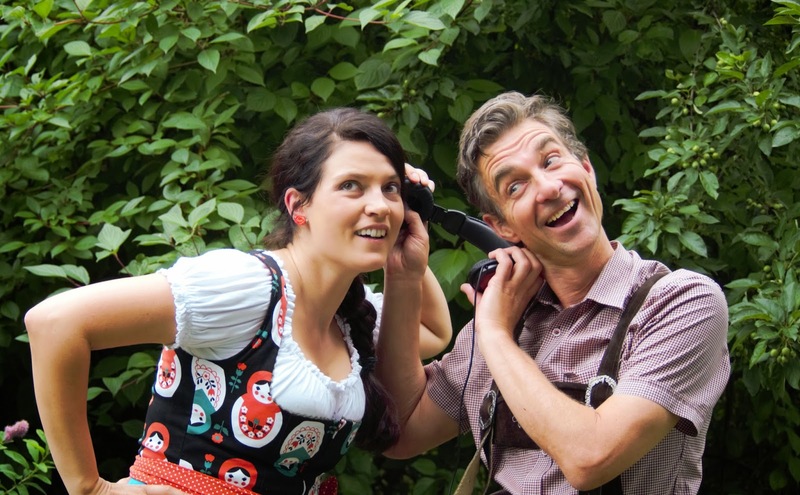 Hailed as the inventor of “Yodelpop”, Maria describes her music as “Bavarian home loving” with catchy melodies and beats. We’re listening to her latest single “Glabbelwirt” and Maria is wearing a dirndl, of course. I tell her that any non-German dressing up in such clothes in England would be regarded as a bit odd. 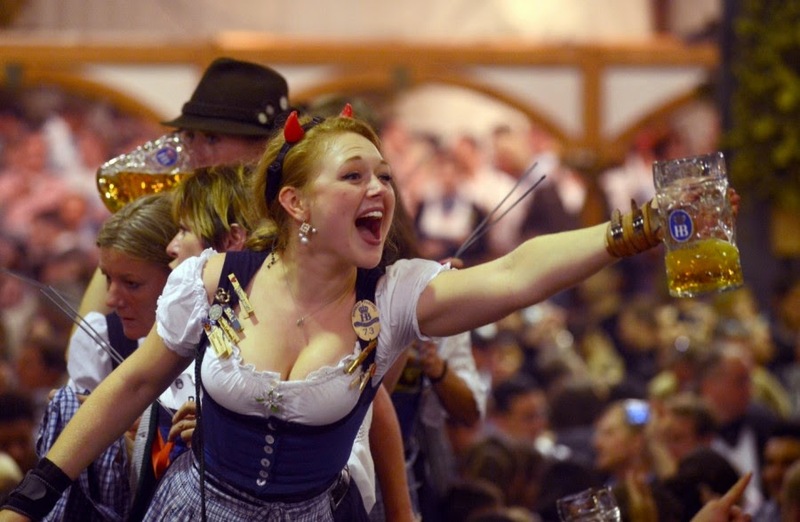 So why do young Bavarians get such a kick out of dressing up in traditional costume? Maria explains it’s all part of a back-to-roots trend, which begun when Germany staged the World Cup and – hitherto unheard of – started draping every available surface area with red, black and gold flags. “This patriotism, a sort of longing for local traditions, became a real movement from around 2010”, she explains. Privately, Maria enjoys Beyonce and Keith Urban. But she too admits singing along to Diamond and Denver. Back to the kindergarten, and they’re playing “Sweet Caroline” once more. Before I can quietly disappear I’m being pulled into a pyramid of linked hands, and, wo-ho-ho, it’s actually quite fun. 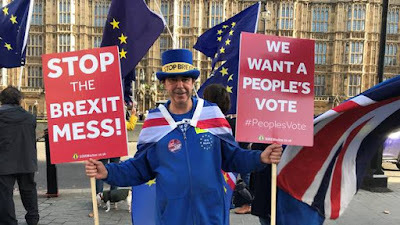 Matthias and Maria are right, the music, motions and traditional costumes – I’m one of the few people at the fest not wearing this attire ­– do create a sense of togetherness, the feeling of belonging to a local community.